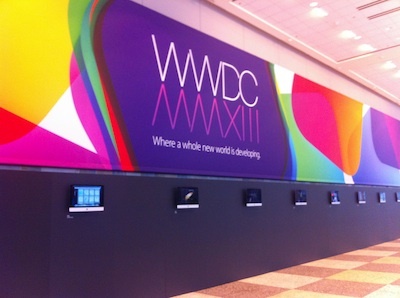 A few weeks ago I attended Apples World Wide Developer conference (WWDC) in San Francisco. I can honestly say it was the most amazing experience of my life. I met many amazing people and came back totally reinspired and full of new ideas for advancing Dropzone. At WWDC, Apple announced OS X Mavericks (OS X 10.9) and provided developers with a beta version of the OS. Apparently Apple has run out of cats to name OS X after and will instead name future OS X releases after famous locations around California. They are starting with Mavericks which is a famous surfing beach. Since I was actually in California for the conference, me and a friend rented a car and drove from San Francisco down to Mavericks to see what the fuss was about. I’ve included a map below to show where Mavericks is – it’s about a half hours drive south from downtown San Francisco. Although Mavericks was a perfectly nice beach it wasn’t so different from the many other beaches I’ve visited. 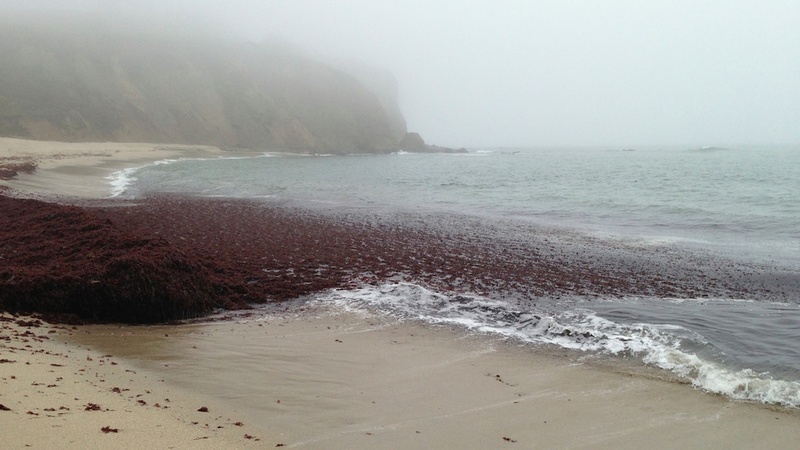 It was rather overcast when we arrived and there was lots of seaweed. Apparently the big surfing waves actually break about half a mile offshore and then only in the Winter when the conditions are just right. 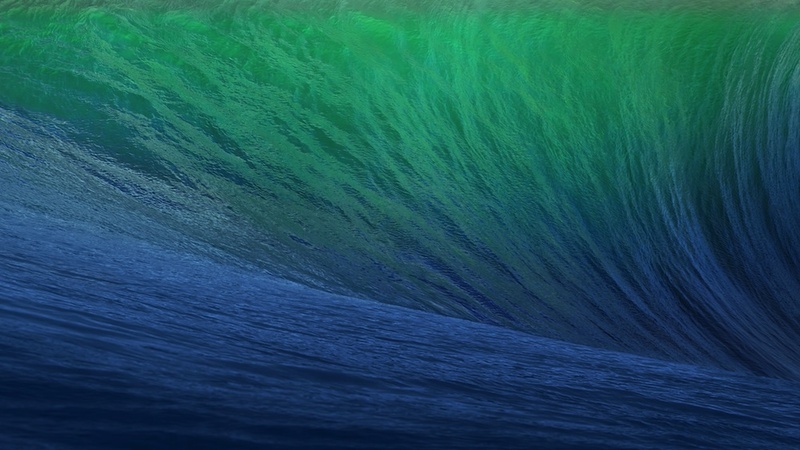 Our hopes of sighting a Mavericks wave of Apple marketing proportions were soon dashed. Ah well. So, now that I’ve travelled to Mavericks – it’s time to make Dropzone support it (a whole lot less fun, I can assure you). Although Mavericks is still far from the final consumer version, I’ve just released an update (Dropzone 2.8) that adds preliminary support. The OS is still under heavy development so it’s possible that more issues will arise in Dropzone in future Mavericks betas. As of Developer Preview 5 though, Dropzone is working well. If you’re on the Mac App Store version – I have submitted 2.8 to the Mac App Store for review and it should be available in a week or two. You will be able to update from the Updates tab in Mac App Store app when the update is approved if you’re on this version. This update also works great on OS X 10.6, 10.7 and 10.8 and you should still upgrade if you’re not running Mavericks as there are other general bugfixes in this version. Update: Dropzone 2.8 is now available on the Mac App Store. If you haven’t tried Dropzone before, you can download a free trial from here. I’d love to hear if Dropzone 2.8 is working well for you under Mavericks if you’re running the developer preview. Please get in touch with me via email or post on the Aptonic forum if you have any issues with this version. Dropzone 2.6 has just been released via the Mac App Store and is also available for direct download customers. This version includes several visual tweaks including a shiny new Circles design. If using the Mac App Store version you can update from the Updates tab of the App Store app. If using the direct version you can update from the Updates tab in the Dropzone Preferences. Also new in this version is the ability to specify a specific Amazon S3 folder inside a bucket to upload to. 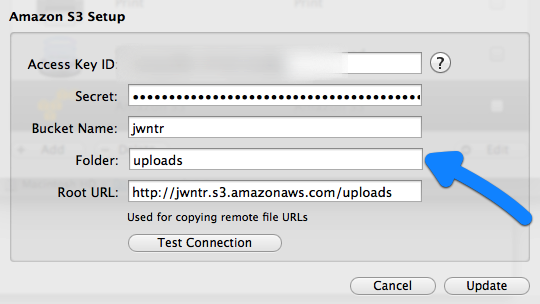 You can set this up when adding or editing a Amazon S3 destination (see below). An issue with Amazon S3 uploading has also been resolved where uploading a file with the same name caused the original to be overwritten. Files with the same name are now given a -1 -2 -3 suffix. If you’d like to try setting up Amazon S3 with Dropzone there’s a comprehensive guide available here. The other major issue addressed in this update is a problem where Dropzone would cause Macbook Pros with both integrated and discrete graphics systems to always use the discrete graphics which resulted in shortened battery life. This issue is now resolved and now only integrated graphics is required for Dropzone. This is a free update for all existing Dropzone customers. 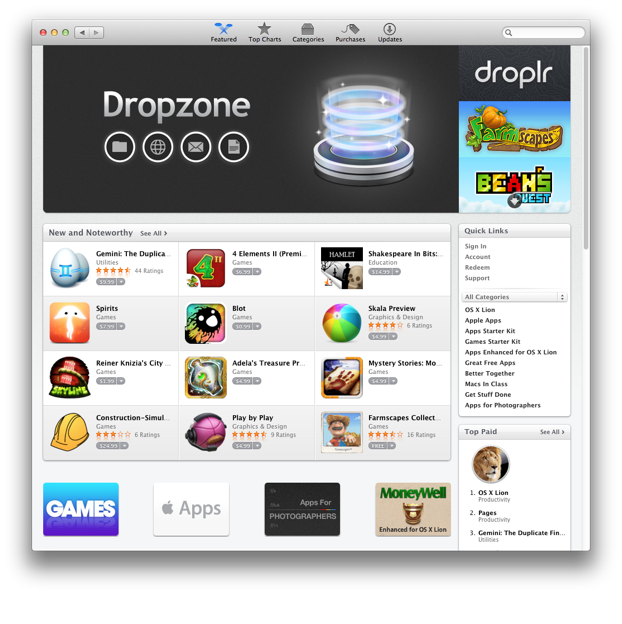 Dropzone 2.5 has now been released on the Mac App Store and is also available for direct customers. 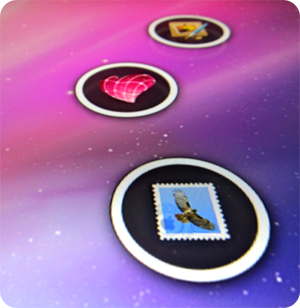 This version adds Retina display support and many bugfixes. If you use the Mac App Store version of Dropzone you can update from the Updates tab of the Mac App Store. The direct version should prompt you to upgrade automatically. Over the past few months, I’ve been hard at work developing new app – It’s called Tweetifier and is for notifying you when you get new mentions on Twitter and also displaying stats about your accounts. It’s available in the Mac App Store now for $2. Check out the app website here. You can view Tweetifier in the app store here. I’ve also written a much longer blog post over at my personal blog on the process involved in making the app. If you’re interested, check that out here. If you try Tweetifier please let me know what you think of it! On Tuesday, I participated in Two Dollar Tuesday. Mike Dattolo from LittleFin emailed me out of the blue and asked if I wanted to participate. He plans to run Two Dollar Tuesday as a regular weekly promotion. One of his own apps, Compartments would be participating in the bundle as well along with Socialite. The idea was that Dropzone and these two apps would be discounted to $2 for one day only. The individual developers would simply reduce the prices of their apps to $2 in the Mac App Store for Tuesday only and we would keep all the proceeds. I was totally unsure whether to participate. Dropzone normally sells for $14 and I was uncertain whether offering such a large discount was a good idea. I worried about a few things: That it would reduce the perceived value of my app, that it would upset other customers who missed the discount and that the support burden would be too high. People tell me that Dropzone was even beating pages and was second only to Lion for a short while. Unfortunately I did not get a screenshot of this. 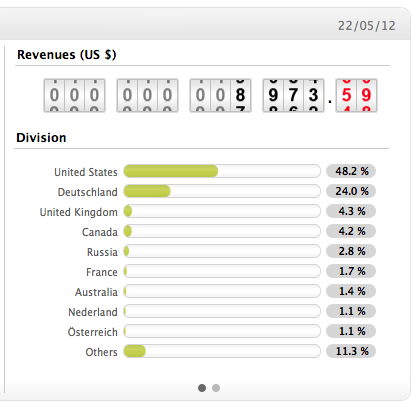 In Germany I even beat Lion and was the #1 selling app overall. I have shown sales for the 19th, 20th and 21st to give you a rough idea of how many I was selling at the normal price of $14. There was a little bit of overlap with the 21st (maybe a few hours) as Mike had us set our prices well in advance so that from the start of the 22nd all three apps would be selling for $2. That is why the 21st is quite a bit higher. 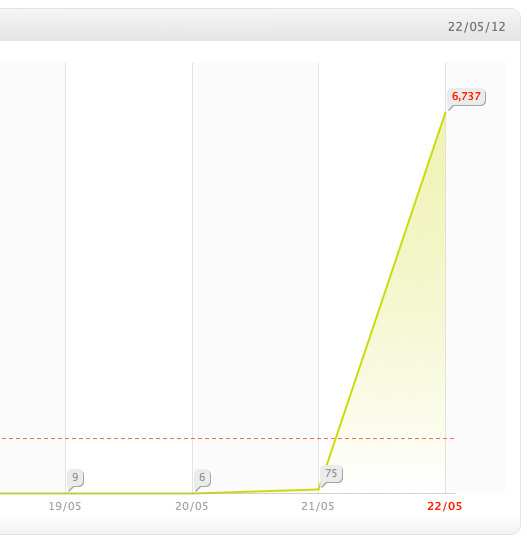 As you can see, I sold over 6700 copies as a result of the sale. I have never before sold any amount close to this much before. When Apple featured me on the front page of the App Store I sold around 300 copies (that was at the old price of $14). So I made over $8000 US after Apples 30% cut has been subtracted. This is beyond my wildest dreams of what I expected to make. A lot of this was due to the efforts of Mike Dattolo who did a fantastic job contacting bloggers and marketing the special. It was promoted on The Verge, Lifehacker and a number of other sites. You should check out his Compartments app, and I highly recommend participating in his promotion if you’re asked. Thank you all for the amazing support and validation of my work. 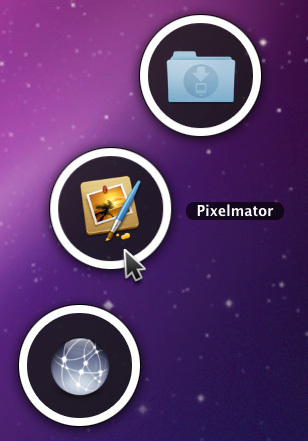 Circles now show labels beside them on mouseover or when dragging something onto them. This was an often requested feature. The main issue here was that if you had two destinations with the same icon (e.g. two folders) then you couldn’t tell which was which. Now you you just brush the mouse over them and the labels are shown. Originally I had the labels always visible but found it looked rather messy. I think the mouseover is an acceptable tradeoff between function and aesthetics. This is how the OS X dock works as well. The TwitPic destination stopped working fairly recently as TwitPic switched off support for username/password authentication and began using OAuth. I’ve now rewritten this destination to support this and bundled it with Dropzone so you no longer need to install it separately. To use this new destination simply go into the Preferences -> Add and then select TwitPic from the action drop down. You will then be directed to the Twitter website and asked to authorize TwitPic with Twitter. 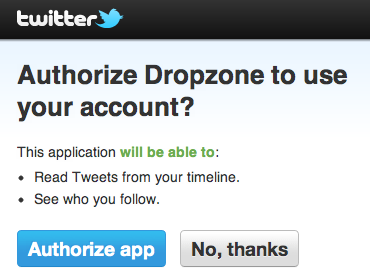 When you click ‘Authorize app’ you’ll be given a pin code to paste into Dropzone to complete the authorization. You can then upload images to TwitPic with Dropzone. The delay before the half circle fades in is given in seconds and 0.3 is the default. The above line would increase it to 1 second and decrease the likelihood of accidental activation. This stuff below here will only be relevant for developers writing destinations for Dropzone. There are two new OptionsNIBs available in Dropzone 2.3. One is for an API key and the other is for a Username+API key which some web services require. Until now, Dropzone 2 was only available via the Mac App Store. There were many reasons for this – and I explained why I made this decision in detail here. I’ve since decided that making Dropzone available exclusively on the Mac App Store was the wrong decision and have now decided to distribute Dropzone 2 outside of the Mac App Store as well. Therefore, I’m pleased to announce that the Non-Mac App Store version of Dropzone 2 is now available. The first thing this means is that if you have an 0.6 license (purchased or via a bundle) you can download Dropzone 2 and use this license key to register and upgrade for free. If you’re considering purchasing Dropzone you now have two options – you can purchase via the Mac App Store or directly from us by downloading the free trial and then purchasing via the in-app FastSpring store. As shown above, in the Non-Mac App Store version of Dropzone there are two new buttons – ‘Updates’ and ‘License’ – In the Updates panel you can control Sparkle updater settings and in the License panel you can enter your registration details or purchase the app. 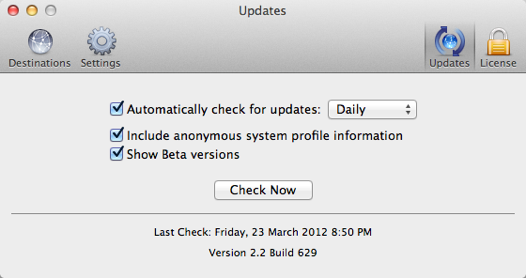 Note the ‘Show Beta versions’ checkbox. 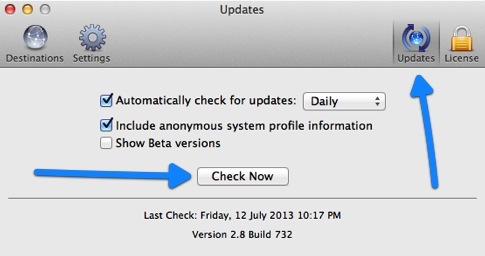 If you tick this you will receive beta updates as well as normal updates. In the past I distributed beta versions of Dropzone manually which was cumbersome and time consuming, this feature will help me to catch bugs earlier and allow a faster release cycle. If you’d like to receive the latest and greatest version of Dropzone and don’t mind reporting the occasional bug, please tick this checkbox. Note that if you’ve purchased via the Mac App Store this doesn’t effect you at all. You should continue to use that version and you will continue to receive updates via the App Store app. The software we like to feature is generally free or close to it, but Dropzone turned out to be so much more capable than initially expected that it was worth an in-depth look. You can read his full review here. I definitely recommend you watch the video he made (above) as it provides an excellent introduction to the app and how to integrate it into your workflow. I’m thrilled to announce that Dropzone 2 is a huge success. Apple featured Dropzone on the frontpage of the App Store worldwide for a week and the app made it into the top 10 productivity apps in most countries, including the US store. This was a dream come true for me. There’s so many talented developers competing for attention on the App Store and for Apple to show Dropzone in the most prominent position available is really exciting. Many new customers discovered Dropzone and I received an overwhelming amount of feedback. One thing is clear – Everyone loves Circles! Most of the requests I received were for more Circles and the ability to move the Circles between the left and the right of the screen. Dropzone 2.1 has just been approved by Apple and adds both of these. You can now add an extra Circle and there’s an option to choose which side of the screen Circles should be on as well. The update is free to all existing Mac App Store users and you can upgrade from the Updates section of the App Store app. I hope you like it! 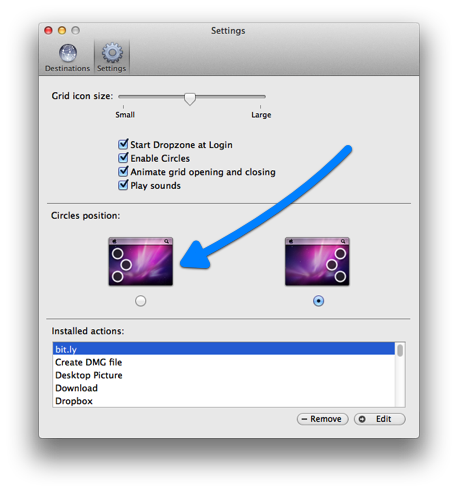 If you’re new to Dropzone, you should check out the newly added User Guide. It will help you get acquainted with the app. I’ve also recently also recently added a guide to setting up Amazon S3 in Dropzone which is now available here. I’m already hard at work on the next version of Dropzone and I can’t wait to share more great features with you soon. I’m thrilled to announce that Dropzone 2.0 is now launched and available on the Mac App Store. To celebrate the launch, Dropzone will be available for the special price of $9.99 USD. This price will be available until the 5th of February (3 days only) and then the price will return to $14.00 USD. We’ve put together an HTML5 demo of circles for you to checkout. It allows you to see Circles in action and shows some of the new features of Dropzone 2. The new Circles feature was inspired by the Radial Menu found in Path 2. Here’s a short video showing Path 2 and Circles. You’ll want to blow it up and watch it fullscreen.